Denny Hamlin piloted the No. 11 FedEx Ground Toyota to a 29th place finish for the Pennsylvania 400 at Pocono Raceway. 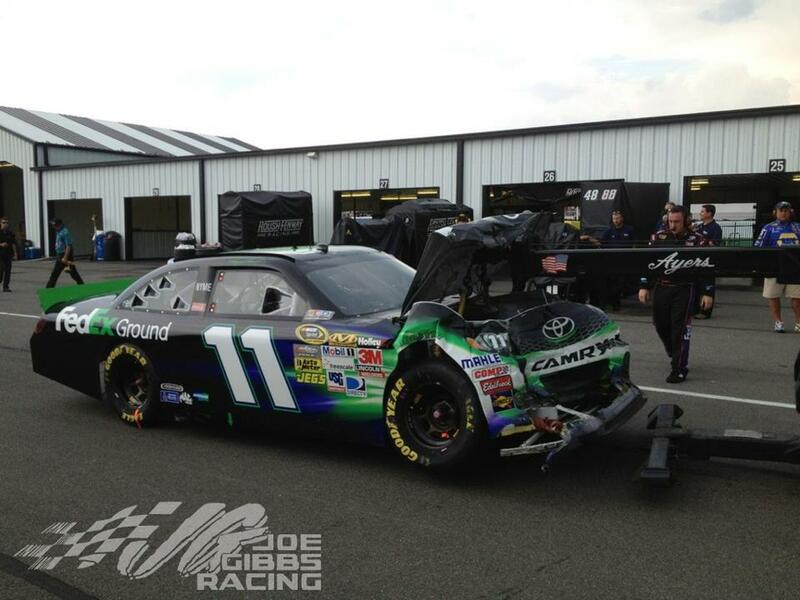 With skies darkening over the Pocono Mountains, Hamlin got tangled with the No. 17 of Matt Kenseth. Shortly after, the rain began to fall and ushered in an early end to the race. Jeff Gordon was in the lead when the rain hit, giving Gordon his 86th NASCAR Sprint Cup Series checkered flag. Kasey Kahne, Martin Truex Jr., Brad Keselowski and Tony Stewart round out the top five finishers. Hamlin’s Joe Gibbs Racing teammates Joey Logano and Kyle Busch finished 13th and 33rd, respectively. The FedEx team came into the weekend with hopes of finishing strong. Pocono has been one of Hamlin’s best tracks, with four wins in 13 races before Sunday’s result. A strong qualifying run putting Hamlin second on the starting grid added to the team’s enthusiasm. A heavy downpour delayed the start of the race by nearly two hours. Once the No. 11 got on the track, the team quickly learned the car had significant handling issues. Hamlin was experiencing a loose race car that appeared to get freer as the race progressed. The first caution of the day on lap 19 brought the FedEx car to the pits for a track bar adjustment to go along with right side tires and fuel. The green flag dropped again on lap 22 with Hamlin in 11th place. The adjustment was not enough to correct the handling issues and the No. 11 fell further back in the field. A second track bar adjustment on lap 45 under green flag racing was also unable to help on a track that is notoriously difficult to manage. Working over the radio, Hamlin and Crew Chief Darian Grubb formed a strategy to address the handling of the car. A welcome pit stop opportunity on lap 69 brought four fresh tires, fuel and a wedge adjustment to the right rear wheel. Hamlin had fallen to 28th place as the field cycled through pit stops. Dark clouds began to return by the midpoint of the scheduled race duration on lap 80, pushing crew chiefs to frantically work to get their car to the front of the field. At the time, Hamlin was on the lead lap and holding 20th place. At The second caution flag of the day waved across the front stretch on lap 86, bringing much of the field to pit lane for tires and fuel. The field restarted on lap 91 with all the teams watching the radar and racing to claim the highest position possible. Just after restarting, several of the frontrunners got tangled and Hamlin was unable to avoid the spinning cars, sending the FedEx car to the garages early.